Today, Innovative Research Group Inc.(INNOVATIVE) is releasing the federal political results from both an online and a telephone poll conducted a month ago. As we become more reliant on online polls which cannot randomly select among voters, it becomes more and more important to understand how and when online and telephone polls can vary. RRD telephone surveys calling a mix of landline and cell phones using live callers. RRD telephone surveys calling a mix of landline and cell phones using interactive voice response calling (IVR). Online surveys that use representative samples of participants who voluntarily joined online panels. In order to provide an estimate of sampling error, pollsters must use a sampling process that gives every voter a known probability of being selected. It is not possible to do that in an online survey for two reasons. First, we are still in a world in which not everyone is online, although this is becoming a smaller and smaller concern. Second, there is no standard system for selecting email or social media addresses which remains a fundamental problem. Pollsters manage this by establishing quotas of different demographic groups and/or weighting the results to ensure the sample looks like the broader public. It is against opinion research ethical standards to apply margins of error to that data. Since almost every voter has some type of phone, both types of RDD telephone surveys allow every voter to have a known probability of being selected. This means both types of phone polls allow reporting that generalizes to the broader population using margins of error. At INNOVATIVE, we rely on live callers over IVR because live callers normally achieve significantly higher response rates than IVR and reducing the potential for non-response bias is something we value highly. In this case, we find little variance. 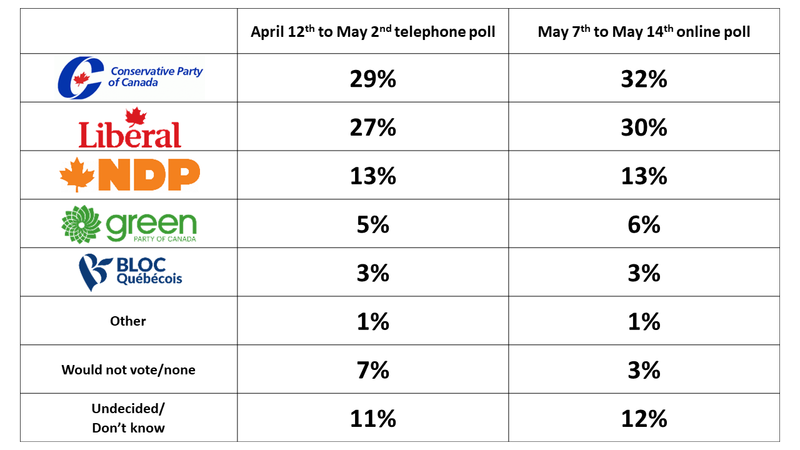 In both polls, we have the CPC at 2 percentage points ahead of the Liberals with the NDP a distant third. There are some regional differences, the most striking of which is the difference between the NDP and Liberal support levels in the Atlantic region where we are dealing with very small sample sizes. As we move toward the next federal election in 2019, we will rely primarily on online samples since they are more affordable and allow us to generate more insight per dollar invested. But because we recognize the limits of online polling to determine the exact level of support within a given level of certainty, we will double check those results with telephone polls from time to time. For further information on these analyses or to explore how our segmentation analysis can help you tackle your pressing public or market issues please call us at 416.642.6340 or send us an email.